Ultimate Body Press Fitness Station is made up of a rather solid dip bar and weighted dip belt for mainly speed and agility training purposes- a very versatile and functional product. 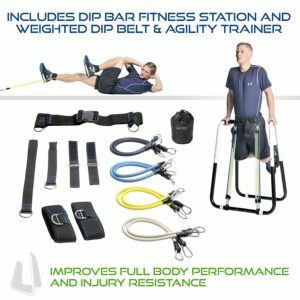 You can purchase the dip bar station on its own or get the whole set that you see on photos- the price difference is just 35 dollars at the time of this review and we think it may be good value as you will also be saving around ten percent on the price of dip bar, if you need the complete full body training package- station and please just have a look through the product photos on this page and on Amazon.com. Gym goers may be aware of the principle that, for each exercise, the muscle growth happens when you do 8 to 12 reps of 3 to 5 sets and at the end- last repetitions in each set when your muscles fail, and the full body training package will teach you how to push through and come out of plateaus. You will be improving your strength on your abdominals, arms, chest and back, with the main dip bar that doesn’t take up much space in your workout area. 60 pounds of resistance is added to dips with the weighted dip belt and your speed, performance, agility and even your resistance to potential injuries will be enhanced with the agility trainer. It is quite a compact and portable set so you will enjoy being able to work out in the comfort of your home, office or elsewhere. You can do compound body exercises and target your abs, shoulders, biceps, triceps and chest quickly and efficiently- knee raises, L-sits, bodyweight rows, tricep and chest dips, thanks to the angled grips and open frame. You will find a variety of guides online, including a YouTube channel and a workout blog so you can find out how to use the fitness station properly and get much better results. Ultimate Body Press Dip Bar is a sturdy and heavy duty, very good quality product that weighs 21 pounds, has a 1.5 inch thick steel tubing, width between the bottom bars is 18 inches, the dimensions are 24 x 36 x 36 inches, and is adjustable to two widths so people that are as tall as 6’5” and as heavy as 350 pounds can use it. Thanks to the foldable design (flat folding and can be put up very quickly) you can carry it easily- relocate and store it. You should be able to put it together quite easily without needing any tools- the assembly is color coded. Price is not very cheap but you’re getting a decent quality, functional and versatile product that will give you options- new ways to tone your upper body and core section. When you first put your hands on it after the assembly, it will feel a little wobbly but when as soon as you put your weight down, it will become very stable. The dip bar or the whole set will be shipped fast via Amazon.com (these are US stock products), you will get hundred percent satisfaction guarantee by Ultimate Body Press, and customer and technical support based in USA.